SalesforceIQ Inbox brings the power of Salesforce and Relationship Intelligence to your email inbox to help identify opportunities, connect with customers, and sell smarter than ever before. On every email, SalesforceIQ Inbox surfaces relevant Salesforce data so you can craft the perfect response. 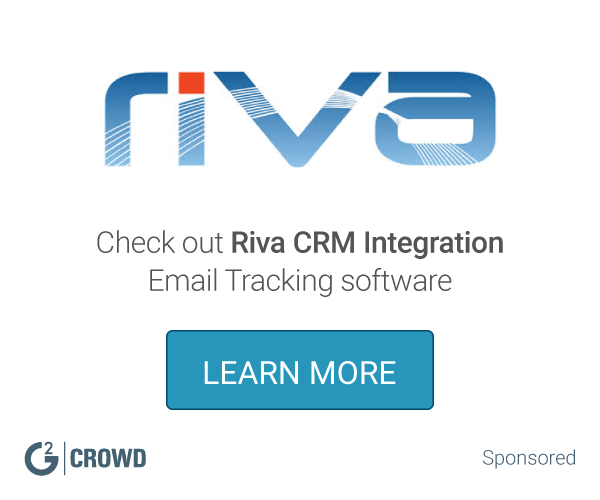 Quickly create leads, contacts, and opportunities without leaving your inbox. And use predictive notifications to stay on top of every deal. "Great features and pretty easy plugin"
The ease of scheduling makes this plugin a breeze to use. (Obvious) Connection to Salesforce makes sure I always have the notes I need, contacts created, etc. Connecting the plugin can be a bit of a nightmare. Most of us had a fairly simple installation, but a few others, we had to get our IT guys involved (and it still took a bit past that - issues with licenses or something). Also, seems to detach too often (1-2 times every 6mos or so). Us it if you already use Salesforce and want easy email tracking, meeting scheduling, and updated contact information. "A Class Extension from Salesforce"
It gives me confirmation that I am speaking with the right person or not. It helps me knowing whether my emails have been read, and immediately seeing information on prospects is wonderfully handy to manage your workflow. Knowing my colleagues have the same visibility to the emails I send them -- they know how many times I've opened and read an email without replying. At the same time, we cannot say if they are opening it bymistake. Sometimes it leaves me in a confused position whether they have the seen my mail or not. If you're looking for a step up from a typical read receipt, SalesforceIQ offers a number of supercharged features. For Salesforce shops, this can save your sales team a ton of time. It connects our email activity with our Salesforce activity, It provides our sales team with better sales activity insights. It helps me solving & managing email inboxes separately from our leads and opportunity pipelines. It is great to be able to view conversations with other sales representatives with customers and be able to accurately pass off accounts without having to check-in with the other reps. It shares me information whether our clients have clicked on our website hyperlink attached in the mail. "A Must Have For SalesForce Users"
I just started using this system recently and I am loving it! I have used many of its competitors in the past like ToutApp, YesWare, and Salesloft and there are things I like about all of them. But this tool for a SalesForce user is by far the best. The thing I link most about it is how well it integrates and works with SalesForce. I can pop into an opp or a lead with the click of a button. It also displays the opp info in the Gmail inbox which is awesome. The only thing I like more about ToutApp at this point is the way ToutApp displays in Realtime who is looking at your email and when they open it. You can do read receipts in IQ but you cannot see them in the same type of Realtime as you can with Tout. If you are a heavy SalesForce user then this is a must have! This tool allows me to quickly follow up with leads and opps. I can know when someone emails me what opp they are part of and I can jump right to their opp in SalesForce with the click of a button. "Salesforce Inbox is the best software to log a emails and set remainders easily in gmail"
Salesforce IQ Inbox helps salesforce user simplifies day to day activity by setting up reminders, send calendar invitations and most importantly log calls and emails directly in Salesforce CRM for better tracking. I recommend any sales and business development executive to use Salesforce IQ Inbox to make their life easier and focus on the core business opportunities. Salesforce IQ Inbox helped us to track call logs and email logs directly into Salesforce CRM. Which helped us to reduce a lot of manual efforts to create the events in Salesforce. We are able to send emails with availability for scheduling the meetings. This email tracking feature is the best I have used to date. It's an incredibly simple plug-in to activate and I've found the actual tracking aspect to it to be extremely precise, accurate, and on time. I had even tested the tracking mechanism by accessing the email from a different device, and the feature notified my instantly that my initial email had been opened, and that I had clicked on and engaged with the content. This was a fantastic tool to use to proactively prospect mid-market and enterprise accounts, as I was able to keep a solid track record of which parties had engaged with content I had sent, and when they did it. It's a fascinating tool in its entirety. The only feature I didn't like was I had trouble figuring out how to turn off notifications from a specific recipient within a tracked email, without turning off the notification for the thread entirely. It was hard to figure out how to accomplish, and could have been designed in a sense that wouldn't take too much time to figure out how. Give it a try! At my last company where we had this, I was one of 20 reps that was asked to pilot the feature to see how we liked it. All 20 of us agreed it was a great fit, and the company added it on to their next contract for everyone in the organization to be able to use. Overall better prospect/customer engagement in the sales process. I was able to use this tool to figure out what sorts of content is getting higher click-rates and what is more appealing to the respective audience, and was able to further target my following emails and audiences accordingly, overall making the process much more efficient and strategic. "Makes sending emails much more efficient"
There's multiple features that are part of the software that speed up the efficiency of my daily email sending such as the shortcut feature and message sending delay. Also, Salesforce IQ Inbox connects directly to Salesforce, allowing me to easily see complete database information of the contacts I'm emailing with. Also, it gives me the ability to create contacts straight from my email so I can constantly be improving our databases information. Most of all, it allows me to easily log all emails so that all communication is being recorded in Salesforce. Mass email sending must be done in conjunction with Salesforce and the lists created within Salesforce. It would be easier to include a .CSV or list straight from the email dashboard as well as craft templates inside of the email dashboard instead of within Salesforce. Be sure to utilize all of the features that it offers to see the most benefit. I've created shortcuts for many things that I type multiple times throughout the day so that I'm saving time with that. Also, using Inbox to create contacts saves time and can help you pull in accurate information. SalesforceIQ Inbox allows me to address the heavy amount of emails daily with efficiency. The benefits I've realized is that with effective tools to support me, I can actually speed up the rate in which I respond to emails so that my clients are receiving answers quicker. Multiple things. I dislike that when you create a new task it doesn't automatically register to the lead or contact or account, you have to manually search. Additionally I don't like that it doesn't work with emailing out of Salesforce itself and you'd think it would because they own it. The email tracking itself is very light weigh-in you can only see if someone opened an email, not if they clicked through or interacted in any way. There is also no reporting. Another downside is read receipts disappear. Logging emails automatically to Salesforce. Easier to schedule meetings. All information logged is readily available at any time. You are able to look back at sales made months and even years ago with their contact information and a brief description of the interaction. All information is available in 1 place instead of having to look through emails and other apps. Can be time consuming as user must take time out of their day to input information. It would be much more time efficient if app took data straight from sales transaction to avoid the user having to manually enter everything. Set time aside for users to input and log data. this will payoff in the long run. solving issue of finding sales leads. managers are able to develop a list of leads based on sale inputs logged a year ago. Salesman can give them a call and ask how they are liking product to ensure customer satisfaction while also seeing if they are interested in upgrading or buying new products. - Pull customer information and contact info. from the email. -The ability to see the opportunities and deals that are associated with tasks and email exchanges that would be otherwise fragmented. Add more mapping functionality with Salesforce pages and records to emails. We are trying to realize the ability of mapping customer touchpoint history and email conversations around deals and opportunities. It allows us to have a central repository of all emails and conversations with the person(s) associated with the deal. "Very handy tool if you utilize everything it has to offer"
It's nice, it gives you read receipts, sentences or paragraphs shortcuts and you can create records in salesforce directly from your email. It can be expensive, I think it costs around 5 dollars a user for the license. Saving time for our sales people when composing emails and our HR department knows when potential employees have opened their emails. "IQ Inbox is a great tool to encourage more use of Salesforce"
IQ Inbox is such an easy tool to use to capture leads, opportunities, and account directly from your inbox. It makes keeping up with everything sales, so much easier when you don't have a lot of time. I wish that it worked with more email platforms and synced with your calendar. This is a great way to encourage your sales team to use Salesforce more. IQ Inbox helped us have an easy way for our sales team to capture new opportunities in a short period of time. It gave you a way to have a "place holder" in your opportunities that you could add more detail to later. "Best way to sync & follow up on SFDC activities"
The best part of the App is that it lives in my G-Mail. I no longer need to BCC a random string of text to have my e-mails captured in Salesforce. It also allows for delayed sending, reminders if there is no response, templates, and an overview of the lead/contact right on the side nav of your inbox. We use it heavily for our AE's to sync, log, and track their activities. The big problem is that it is a Salesforce App, they own it, but it still goes against your API call count. Seems odd that they have you pay for it but it goes against your volume count. However, it's not a ton of calls so minor issue on that front. The other piece is I would like it to be automated when it sync my e-mail. Currently a window pops up asking whether or not I would like to log the activity. My outlook is to log EVERYTHING automatically. "A helpful addition to Salesforce CRM." - It doesn't always load when you start up gmail, and as a results I have to open a new window. - When opening gmail, the lag can be annoying. A must have for your any sales team which uses salesforce! The ability to create tasks relating to the emails allow us to keep track of our prospects. It is a great tool and allows the rest of our sales team to be more efficient. I really love the email templates and ability to create a new record from an email very quickly. Makes it super easy and fast to send emails or add responses that I type on a regular basis. I hated Salesforce until we got SalesforceIQ. There are many other cool features (like calendar availability, scheduled emails, creating a task, and read receipts), but I don't use them regularly. The templated emails have changed the way I use Salesforce and make my job much faster and easier. I wish I could use it with Safari/Firefox on my Mac at home and not have to add another browser just to use it. There is nothing about the software that I actually dislike. I am excited to see what kinds of features are added in new releases. You should be able to use gmail comfortably and it helps if you enjoy exploring software on your own. I am able to send templated emails very quickly without HTML or other gimmicky distractions. I love templated emails, but people are more inclined to open an email that looks personally addressed and written (and less like a marketing email blast). I've always been a fan of email tracking software since I heard about it about 3-4 years ago. I initially used Sidekick before SF IQ, and have stuck with it ever since. If you have Salesforce, IQ's necessary for your sales team. I introduced many of the sales floor to the application at my previous company, and my current company luckily was already on board. Also super easy to log emails in/out automatically. The original version (pre-acquisition by SFDC) had more functionality. One example was the ability, "if not reply," then remind me in X amount of days. This was helpful in keeping follow ups within email that weren't super import or requiring a separate task in SFDC. Now that I've gotten used to it not being there, I've been able to set tasks farther in the future and check back in on it to see if they've gotten back to me or not, but it was a feature that separated it from similar tools. If you have SFDC, just use it. If you're paying for something like Hubspot's version, probably not worth it for your org. I like being able to track who's opening my outreach, especially when it's an initial proposal or great prospect. "Ease of Use is King when considering inbox enhancements"
I have had the app sometimes crash Gmail and needs to restart. Not always super easy to log into. My recommendation--use the trials of the other tools! I've used others like Ebsta and Cirrus Insight and they all have their strengths--but this one (obviously) has the tightest integration with Salesforce. "Great for syncing gmail emails to SF"
It easily allows you to sync your emails from your gmail account to salesforce for tracking. Not only can I sync outgoing emails, but also incoming emails. If you have to many people on an email, you will not be able to sync the email with Salesforce which causes me to loose out on tracking on a few surveys I send. We needed to be able to see/track email communication with prospects and customers. What I absolutely LOVE about Salesforce IQ is the meeting availability feature. I use this feature all the time when I need to book meetings with my clients and prospects. It makes it easier not only for me but for the other person. At times it will log me out and it won't allow me to log an email. Sadly it doesn't work on your cell phone device. I would highly recommend it if you are looking to improve email efficiency and contact creation. It helps keep my accounts in Salesforce updated with my correspondence . Booking appointments is fast and easy. Also I creating templates for common email responses improves efficiency. "Integrate your inbox with Salesforce!" As a busy Account Executive, it can be difficult prioritizing what you need to do that day. With SalesforceIQ Inbox, I can have my tasks listed for the day on my gmail inbox UI making it easy to reference what I need to complete that day. I wish that SalesforceIQ could have read receipts and clicks within the email itself and not in another separate folder. It's the best in syncing activities and completed tasks to Salesforce, especially when you're managing 50+ opportunities at the same time. This makes it super easy to schedule what ever I need because its super easy to understand and easy to use! If you are looking for something simple and easy to use while tracking your customer relations, this is it! easy email tracking, meeting scheduling, and updated contact information all at your finger tips! I like how I can automatically log emails from gmail through Salesforce. It is also a great tool to manage tasks, set up reminders, and overall managing my personal pipeline. Sometimes it lags a while so that will be frustrating. Tasks sometimes won't update from Salesforce to IQ ie I will still have tasks populated in IQ that I have cleared in Salesforce. Sending emails through Saelsforce is a bit old fashioned and the format does not look aesthetically pleasing. However, with Salesforce IQ, I am able to create an email through gmail and attach it directly to the lead record in Saelsforce. "Solid addition to Sales Tech Stack"
Makes it easy to associate activities to specific opportunities within Salesforce. Previously, activities were associated at the account level which made it difficult to quickly/usefully determine what has happened for a specific opportunity. Doesn't always pull up the correct record. Some users have to sign in/out of the extension to get the right record to show. Increased adoption and data quality with salesforce. Much easier and intuitive to use SalesforceIQ Inbox vs BCC'ing salesforce. Also helps users quickly identify contacts that are not in salesforce. I love being able to receive timely notifications of when someone views my email, and what links they click on. Often when you are engaging with customers you don’t know how the emails are resonating with your targets you are engaging. Having the information that Salesforce IQ gives you can be incredibly powerful. You are able to close deals quickly by scheduling meetings without the hassle. It makes it easy to update your pipeline and log sales activity, making sure you never miss an opportunity. The only thing I would improve, Would be the icon for the accounts you are adding, Should be able to be customized. You are able to log customer customer communications automatically, with no manual data entry. "Customizable and Powerful but a little slow and dated UI"
Salesforce contains all the data and information I need to manage my pipeline and workflow. It's accessible by computer as well as my mobile phone. Can run a little slow at times. I'd like it to anticipate my next action better because each screen tends to contain a lot more info than what I actually need at the moment. Maintains a massive database of all prospects, customers and their interactions. Accessibility controls are thorough and customizable. "IQ Inbox is a must have for any SFDC user"
Calendar integration for availability and the ability to log emails to standard and custom objects. Logging.emails to pertinent records on Mac or iPhone ensures our business gains insight on activity. SalesforceIQ Inbox automatically tracks my day to day activities. I wish that the tool was smart enough to auto attach & not have a pop up. This product lowers the time it takes to log activity. Hovering over email addresses for enrichment on people. Adding and adjusting stage levels from the inbox itself. Also scheduling straight into emails has become a habit for showing availability for meetings. Not all emails sync to Salesforce IQ. Sometimes hard syncing emails still doesn't update the profiles in Salesforce IQ. If you hate regular Salesforce you'll probably like IQ. Fingers crossed they continue to add features similar to the full Salesforce suite. Solving managing email inboxes separately from our leads and opportunity pipelines. It's great to be able to view conversations of other sales reps with customers and be able to accurately pass off accounts without having to check-in with the other reps.
"Much better than the real Salesforce"
It's far easier to use than traditional Salesforce. It's very intuitive and lightweight for small teams that need to move quickly. The only thing I would change is the UI on the inbox feature. If you're working on a laptop with a normal screen size, the pop out is obnoxious when you are trying to do your email for things other than sales activities. I've used 10+ other CRM tools and this is by far the easiest and most intuitive to use. It's a way for me to cut out a traditional step that many other CRM's require. I like how the Inbox feature automatically synchs and makes thing easier. "Sales force system is essentially unmatched"
The abundance of emails received through the business allows this software to streamline the time it takes to sort through each one. The campus is rather large and the storage this email server can accommodate is insane! Salesforce Inbox is a fantastic tool for Sales and Quality users to tie their email chains back to the related records. This keeps all the "Back & Forth" in one place. iQ inbox has great features but definitely comes with a price tag. One great use case we have is for Quality managers to tie email conversations back into the existing quality cases. "Wonderful Features, but a Little Creepy"
Knowing whether your emails have been read, and immediately seeing information on prospects is wonderfully handy to manage your workflow. Knowing my colleagues have the same visibility to the emails I send them -- they know how many times I've opened and read an email without replying. Connects our email activity with our Salesforce activity, connecting the two in a more homogeneous way. Provides our sales team with better sales activity insights. "SalesforceIQ Inbox is a great tool and getting better!" I like how easily it allows me to manage all of my tasks, log emails to SFDC and create new tasks/stay on top of my opportunities. I wish I were able to look at tasks that are only due that date and overdue as well as having read receipts on individual emails. This allows me to be a more efficient and successful salesperson. Being able to see list of tasks while working within gmail. It does not integrate well w/ Gmail accounts. My calendar cannot sync. Cannot sync w/ google calendar. "Great tool for email confirmation receipts"
SalesforceIQ has the ability, once working, to go back through and scrub your inbox for interactions with contacts who are in your CRM and log that information without you having to manually log everything. It was difficult to set up. I had to try to make the connection to my inbox maybe 4 or 5 times before it finally made the connection and then it took about 2 work days to connect and sync. Sales and contact outreach tracking. For any professional who uses salesforce as their primary CRM this tool made it easy to make sure all of your email activity was being recorded with accurate information. Sometimes it would crash for no apparent reason. Also if there were other contacts with similar names and emails it became easy to misalign the information. Record keeping and customer follow up became much easier with inbox. Allowed me to have verbatim notes immediately integrated into the crm. The complete integration with Salesforce makes my work much easier and the possibility to send availability to customers is great. Buy it now, it is very nice to use, consider buying it in january as salesforce offers better pricing in that period. "A swing and a miss for Salesforce"
Ease of installation and ease of use. It's a good idea if properly iterated upon. I have a number of chrome extensions competing for space in my browser sidebar, there are far better tools to have in that space than this one. integration between sfdc and email client gmail. Hoped to see an ability to more quickly make changes from the extension, but seems that it's easier to have an sfdc tab open in chrome and switch tabs. the ability to log emails into salesforce as soon as the email is sent. also love the ability to track how many times emails are opened. sometimes if i click on something too fast after sending the email, i will lose the ability to log it in salesforce. understanding how much interest a prospect has by the amount of times they open the email. also sometimes if i know they are opening my email, i will give them a call to follow up since they are top of mind. "I don't really know what it's doing"
Make sure you have someone who really knows their stuff with Salesforce because people like me will be asked to use it but not sure why. Attaching important information (aka email correspondence) across many objects at once. I don't think there was anything I disliked! Become familiar with all features! So much more than just logging activity. Logging important activity into Salesforce without having to actually login to SF > find record > copy/past info. So simple! It saves me a great deal of time. Also, the hardest part of SalesForce is getting the sales staff to actually enter in data. IQ makes adoption that much easier. Saving time, better customer service, higher visibility on sales activities. "SalesforceIQ inbox makes email a breeze"
not much to dislike, sometimes can be a bit slow to load in gmail. Record keeping, clean SFDC data. Allows the entire team to understand the context of email interactions within SFDC without having to manually log or bcc SFDC. "Needed for all sales careers"
SalesforceIQ is amazing tool that is an important non-traditional CRM solution. It automatically tracks and analyzes the day-to-day interactions that help drive professional relationships. Overall its easy to use and keeps all your emails and opportunities under the client so its quick to find. I like that I know when they read my emails and the calendar is perfect for reminders. "User Friendly Platform Makes Marketing Campaigns A Breeze"
It allows us to manage multiple projects. The only thing I would can be is the ability to easily add multiple addresses within one company name. We are able to manage multiple projects at once. "Salesforce Email Integration with Outlook"
I really like the mobile app for Salesforce Inbox. I believe that it can help my outside sales team use Salesforce. I cannot get my outlook to work with it on my desktop. I believe it will help our adoption to salesforce. * We monitor all SalesforceIQ Inbox reviews to prevent fraudulent reviews and keep review quality high. We do not post reviews by company employees or direct competitors. Validated reviews require the user to submit a screenshot of the product containing their user ID, in order to verify a user is an actual user of the product. Hi there! Are you looking to implement a solution like SalesforceIQ Inbox?